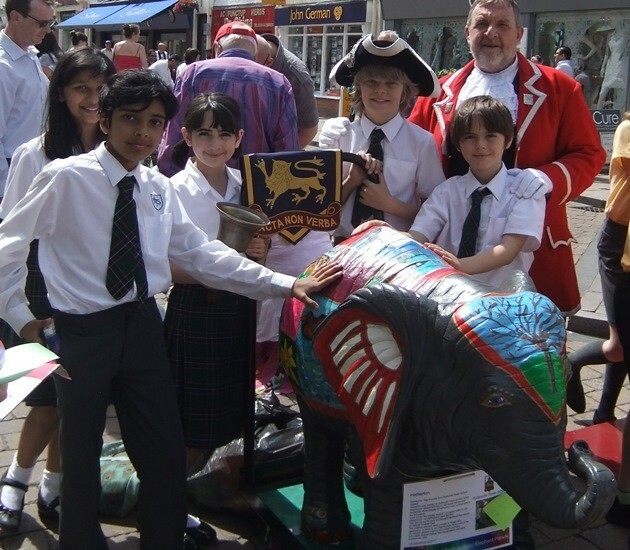 But then it transpired that Mrs Shaw and Year 6 were taking part in the inaugural Baby Elephant Parade, a new addition to the well-established Lichfield Festival. It was for the class to design and decorate our elephant and they took inspiration from Walsall Arboretum. They named him Hatherton, after Hatherton Lake, a focal point in the arboretum, and their painted design includes the lake as well as our resident cheeky squirrel – a regular visitor from the park to the playground. Mrs Shaw and some of Year 6, joined by their parents, took part in the parade of 35 elephants through the streets of Lichfield and had a fantastic time. Hatherton will be on display in prime position outside Lichfield Cathedral until the end of this year’s festival. Click here to find out more about the elephant parade. Pupils are pictured with Hatherton and the town crier.